Did you know that the most common disease that veterinary practices deal with is obesity? Almost 50% of the animals we see are overweight putting them at much greater risk of arthritis and lameness, back problems, heart and lung disease, liver disease and reducing average life span by 2 years. Reducing your pet’s weight to a healthy level is the single biggest change you can make to improve quantity and quality of life. . If your pet is struggling with weight gain, we have a new food available which is proven to maximize your pet’s metabolism. It has been proven to reduce weight safely by 28% in 2 months. What a breakthrough! So why wait? Come down and see our lovely nurses, free of charge for a weight consultation. We can advise you on what and how much to feed your pet. 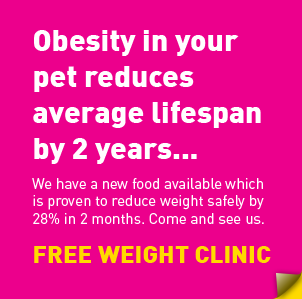 We also carry out regular free weigh-ins for pets on diet plans to encourage you and ensure your success.